All Elite Wrestling (AEW) has sent in word about the company’s upcoming event fro Jacksonville, FL, Fight for the Fallen. The show will take place on Saturday, July 13th from the Daily’s Place Amphitheater at TIAA Bank Field. 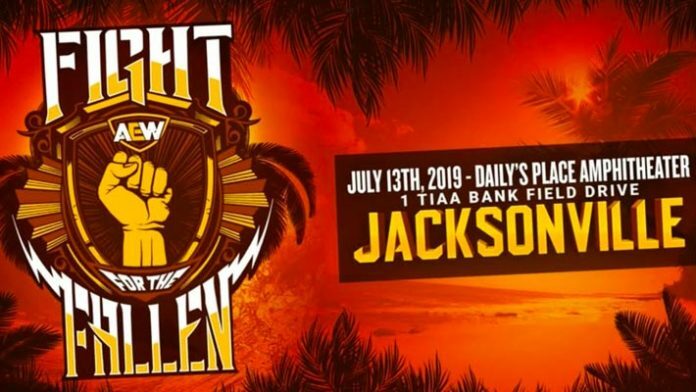 Proceeds from AEW: Fight for the Fallen will benefit Jacksonville’s Victim Assistance Advisory Council (VAAC), which provides assistance to crime victims and their families. Tickets for Fight for the Fallen go on sale to the general public this Friday, April 19th. There will be special pre-sale Thursday morning. The pre-sale code is AEWFIGHT.